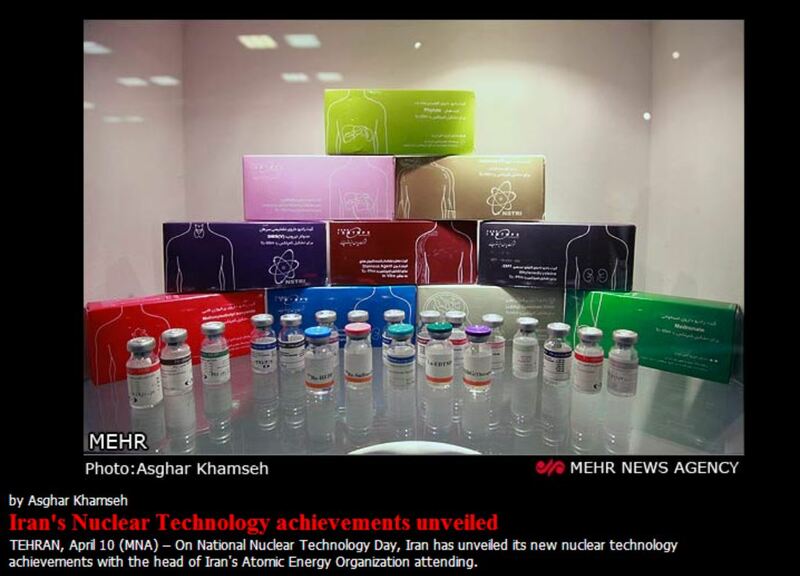 Sample medical isotope packaging on display at this week’s National Nuclear Technology Day in Iran. Partial screen-grab from Mehr News. Iran has offered a scientific and logical proposal to clear up any ambiguities over the country’s Arak heavy-water reactor, a senior Iranian official says. After the signing of the Geneva deal dubbed the Joint Plan of Action between Iran and six world powers, Tehran put forward a scientific plan to resolve the West’s alleged concerns over the Arak reactor, whose closure had been demanded by the Western states, said Head of the Atomic Energy Organization of Iran (AEOI) Ali Akbar Salehi on Wednesday. In November 2013, Iran and the five permanent members of the United Nations Security Council – the US, France, Russia, China and Britain – plus Germany sealed an interim deal in Geneva to set the stage for the full resolution of the dispute over the Islamic Republic’s nuclear energy program. “In our plan, we explained that we would redesign the heart of the Arak reactor, so that its production of plutonium will decrease drastically. They (Iran’s negotiating partners) were surprised when they saw our scientific and logical reaction,” Salehi said. The Arak reactor, which uses natural uranium to produce radio medicines, is planned to gradually replace the Tehran Research Reactor, which produces medical radioisotopes for cancer patients. The comment by Ali Akbar Salehi, head of Iran’s atomic energy organisation, was the latest sign that a compromise may be possible over the Arak research reactor, which the West fears could yield weapons-usable material. Iran denies any such aim. The fate of the heavy-water plant, which has not yet been completed, is one of the central issues in negotiations between Iran and six major powers aimed at reaching a long-term deal on Tehran’s nuclear programme by an agreed July 20 deadline. Russia’s chief negotiator suggested after the April 8-9 talks that progress had been achieved on Arak. “The possibility of a compromise on this issue has grown,” Interfax news agency quoted Deputy Foreign Minister Sergei Ryabkov as saying. Changing the reactor’s fuel, however, could reduce such a threat, according to a team of experts at Princeton University’sWoodrow Wilson School of Public and International Affairs. The researchers, all from the Program on Science and Global Security (SGS), propose their technical modifications—including changing the operating power of the reactor—in the April issue of Arms Control Today. “The changes we suggest could dramatically reduce the reactor’s production of plutonium while maintaining the reactor’s performance for peaceful applications,” said co-author Frank von Hippel, a founder of SGS, and professor emeritus of public and international affairs. The Princeton team urges that Iran dramatically reduce its potential plutonium output by converting the reactor from using natural uranium fuel to low-enriched uranium fuel. This would greatly reduce the quantity of U-238 in the fuel that is turned into plutonium in the reactor by neutron absorption. With low-enriched fuel, the reactor power could be reduced without loss of performance and so further reduce plutonium production. “The steps we describe are technically feasible and would not reduce Arak’s usefulness for civilian purposes. They provide a sound basis for resolving one of the key points of contention in the talks on Iran’s nuclear program,” said Ali Ahmad, a research fellow in nuclear technology policy, who performed the computer calculations that underlie the Princeton team’s proposal. A bit more background on plutonium production from nuclear reactors can be seen here. Although that background piece was prepared for standard light water reactors, the concept remains the same where we see that plutonium is only produced from the U-238 in the loaded fuel, while U-235 does not produce plutonium. The Princeton plan changes the fuel in the Arak reactor from unenriched natural uranium, which has a high U-238 content, to a lightly enriched version where there is more U-235 than in the originally planned fuel for the reactor. This allows the reactor to be run at lower power but still produce the U-235 reactions that are desired in using the reactor for its declared purpose of medical isotope production. I fully expect that hawks will next claim that even if Arak is modified so that it doesn’t produce enough plutonium in a year for a bomb (Dahl notes here that Arak under the new design would produce less than a kilogram of plutonium per year, while also pointing out in the more recent article that it would produce nine kilograms a year in the initial design. Around 8 kilograms are needed for a plutonium bomb. ), the plutonium produced could still be used as a trigger for a bomb made with highly enriched uranium. See here for a peek at the environmental catastrophe that has been US plutonium trigger production. If the US has had that much trouble with plutonium triggers, I doubt Iran will be wanting to get into plutonium reprocessing just for triggers. Iran has set up a unit to produce oxygen-18 isotope which is an important precursor for the production of fluorodeoxyglucose used in positron emission tomography, Head of the Atomic Energy Organization of Iran (AEOI) Ali Akbar Salehi announced on Wednesday. “Today concurrent with the National Day of the Nuclear Technology, the unit for the production of oxygen-18 isotope starts operation in Arak research reactor,” Salehi said, addressing a meeting of AEOI experts and directors with Supreme Leader of the Islamic Revolution Ayatollah Seyed Ali Khamenei in Tehran on Wednesday. Unlike previous rounds the May meeting will be open-ended to allow negotiators to meet all week if needed as they increase efforts to seal a deal, she [a senior US administration official] said. It seems to me that things are coming together at a sufficient pace that the optional second six month negotiating period may not be needed. I think 8 pounds would be more likely the correct approximate figure. The quantity needed depends on the design; the first core design (Gadget and Fat Man) was very conservative (solid sphere) and it used 6.2kilos of Pu. More advanced designs used as thermonuclear primaries (hollow sphere, boosted with tritium/deuterium) use around 3 kilos of plutonium. Reportedly it is possible to use even less (down to 1 kilo) but the assembly has to be very efficient, i.e. highly advanced implosion design. Non-enriched U-powered reactor moderated by heavy water is the ideal design (apart from the high cost of heavy water) for making weapons grade Pu239, it is what Israelis built near Dimona in Negev. If you want weapons-grade Pu, you would operate the reactor at low burnup (= frequent fuel change). Switching to low-enriched U fuel and long intervals between replacing the fuel rods (high burnup) would not only produce significantly less plutonium in the spent fuel, but the plutonium will have far more Pu240 (together with Pu241, 242): it will be the typical reactor-grade Pu which still can be used to build fission bombs but is inferior (high neutron background, high radioactivity, high heat generation). It would not be worth reprocessing. The nine kilogram figure was what Dahl had reported in his Reuters articles. I’ve finally gotten a chance to read the full paper from the Princeton group, and they cite the IAEA as working under the assumption that it takes 8 kilograms of plutonium “for a first-generation nuclear weapon”. The US announced today that it would refuse a visa to Hamid Abutalebi as Iran ambassador to the United Nations. The State Department refused to give a reason, the White House said Mr. Abutalebi would be barred US entry over concerns about his involvement in the 1979 U.S. Embassy hostage crisis in Tehran.